The human body has 11 major anatomical systems, 206 bones, and dozens of organs, tissues, and fluids—that’s a lot to learn if you want to ace your anatomy & physiology class! Luckily, you can master them all with this hands-on book + online experience. 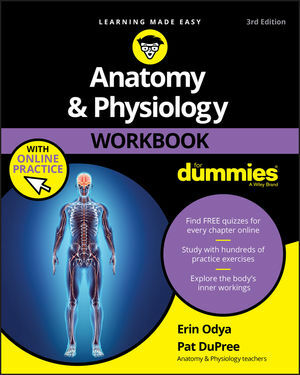 Memorization is the key to succeeding in A&P, and Anatomy & Physiology Workbook For Dummies gives you all the practice you need to score high. Inside and online, you'll find exactly what you need to help you understand, memorize, and retain every bit of the human body. Jam packed with memorization tricks, test-prep tips, and hundreds of practice exercises, it’s the ideal resource to help you make anatomy and physiology your minion! If you’re gearing up for a career in the medical field and need to take this often-tough class to fulfill your academic requirements as a high school or college student, this workbook gives you the edge you need to pass with flying colors. Erin Odya teaches Anatomy & Physiology at Carmel High School in Carmel, Indiana, one of Indiana's top schools. She is also the author of Anatomy & Physiology For Dummies. Pat DuPree taught anatomy/physiology, biology, medical terminology, and environmental science.